Is your multichannel having the desired impact on both your customer and business? The life science industry has long been steadfast in its view of how to best engage with customers. Getting 'feet on the street' and maintaining share of voice was always the goal but this model needs to rapidly evolve to be more effective and affordable. Customers are now in the driving seat and are shaped by their experiences as consumers in other industries. This is resulting in little tolerance for push tactics, irrelevant contact/content and engaging in ways that aren't on the customers' terms. Customer experience is now the new battleground and the winners will be those who deliver a consistent and positive experience with every interaction, across all channels, time and again. The life sciences constantly look to other sectors for examples of leading practice but often struggle to apply learnings to their own business. This is because what constitutes an 'experience' and how to deliver it varies significantly across sectors. The life sciences have some unique characteristics in how 'purchasing' decisions are made, the regulatory environment and the fact there are limited post 'sale' touch points to build the experience over time. While challenging, there are still plenty of levers to pull for those that approach it in the right way. Life science companies need to realise they are not Apple… but that's ok… they don't need to be! Having the capability, agility and flexibility to execute on this and deliver business results. Unfortunately, there is no silver bullet when delivering a great experience. It takes time and hard work. Leaders invest in a robust multichannel approach that is underpinned by four critical capabilities of data and insight, technology platforms, integrated business processes and the right people and skills. When it comes to a robust multichannel approach, the diagram outlines a leading end-to-end approach to multichannel strategy and execution. 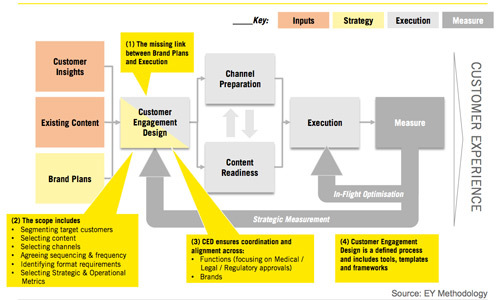 Too often life science jumps from brand planning to channel execution, with little thought of the customer in between. What is often missing is the 'customer engagement design' step that injects the customer perspective into the process and drives alignment between what the business and its customers need to achieve. This not only helps find the 'win-win' situations but also ensures engagement activity is coordinated across brands and functions. Having the processes to design a multichannel strategy is one thing but it is not enough in itself. Four critical capabilities of data, technology, processes and people are required to enable this. When building multichannel capabilities companies typically have a dominant focus either on data or technology (which together enable responsiveness and relevance), or on people or processes (which together enable standardisation and industrialisation). What is essential is a balance to avoid falling into the traps of 'insightful inertia', where you have good insight and a platform but no ability to execute, or 'flying blind' where you have strong processes and people capability but lack the platforms and the insight into your customers' needs to drive timely action. The 'Engagement Masters' are the ones who take a balanced approach and establish the processes and infrastructure to drive efficient and effective multichannel engagement. Integrate and amplify campaigns - experience is built up over time across every touch point. Think about the journeys you want to take customers on, how you measure this and how channels reinforce each other and don't 'launch and leave'. The life sciences clearly have some work to do to live up to customers' growing expectations but the ultimate winners will be those who show the leadership to invest in the right capabilities, move beyond pilots and are able to nurture and protect the customer experience as it is built up over time.